It occured to me recently as I was preparing for the day that I was on my 6th straight box of cereal without having an alternative for breakfast. (unless you count sleeping through breakfast) This was a problem. Variety is the spice of life and provides some welcome balance. Plus, cereal was beginning to get really old. Enter steel cut oats. Steel cut oats are the super heroes of the oatmeal family. Everyone knows oatmeal is good for you, being high in fiber and proven to help lower cholesterol; but steel cut oats are also whole grain and have a lower glycemic index to boot. Steel cut oats are from the inner part of the oat kernel (known as the groat) that have have been chopped into smaller pieces. Your classic rolled oats is the groat that’s been steamed, rolled and flaked. Quick cooking oats are the same as rolled oats except chopped. 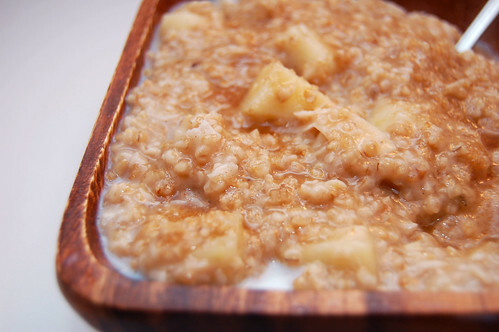 Steel cut oats offer a nuttier flavor and have a chewier texture than rolled oats. 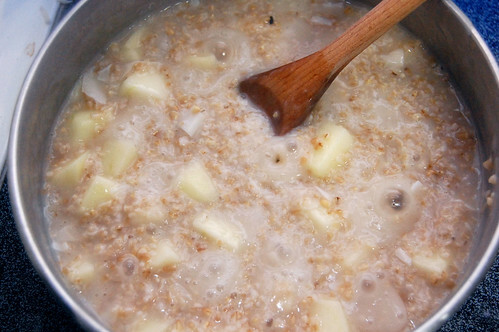 Rolled oats sometimes can resemble a paste or porridge. Steel cut oats are thicker. Creamier. The only down side is the time it takes to cook. Because it’s less processed you’re looking at approximately 30 minutes to cook. I think it’s well worth the effort. Give this recipe a shot or any variation that you apply to your regular oatmeal. I doubt you’ll be disappointed. If you like your apples crisp like me, then add them at when serving. Otherwise, add with the oats and coconut. Put the water, cinnamon stick, salt and sugar in a small pot and bring to a boil. Add the oats and coconut (and potentially the apple); simmering for 25-30 minutes. Remove from heat and serve with milk, ground cinnamon and additional sugar to taste. Edwin, I must say, this looks SIGNIFICANTLY better than my Quaker Instant Peaches-N’-Cream oat paste I was considering this morning. I’ll have to try making it sometime this week, then I’ll see if I can get an amazing half-blurry, half-“in focus” shot of it like you did. Even your photos look edible! P.S. Thanks for the Christmas present… now we finally get to taste something from the DinnerCakes kitchen without making our own sloppy version! Yeah, steel cut oats are a great change of pace when you have a few minutes. Peaches would work well. Glad you liked the cookies. Hope they’re still good after shipping.